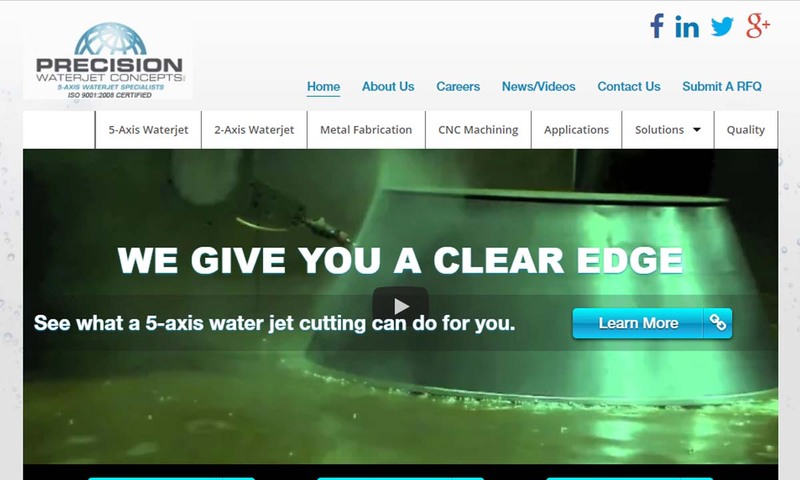 A reliable source for Waterjet Cutting information and a resource for accessing leading Waterjet Cutting and suppliers. Waterjet Cutting Waterjet cutting (water jet cutting), also known as hydro cutting, is an industrial process with which manufacturers can cut materials. 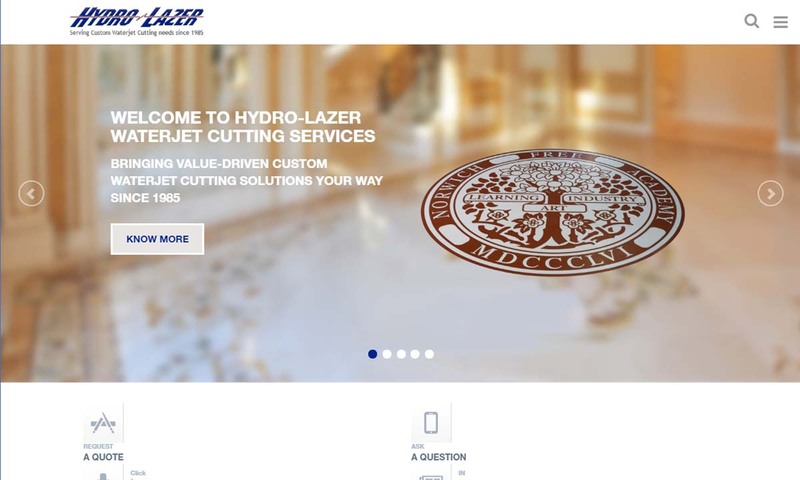 Here at Hydro-Lazer we perform water jet cutting on a range of materials including: aluminum, brass, composites, ceramic, cork, polyurethane, steel, wood, plexiglass, acrylic, foam, copper, marble, granite, rubber and plastic. Water jet cutting is how we create precision parts for our customers. We work hard to create the perfect products for your needs. Whether you need a stock product or something completely new, we can make it happen. 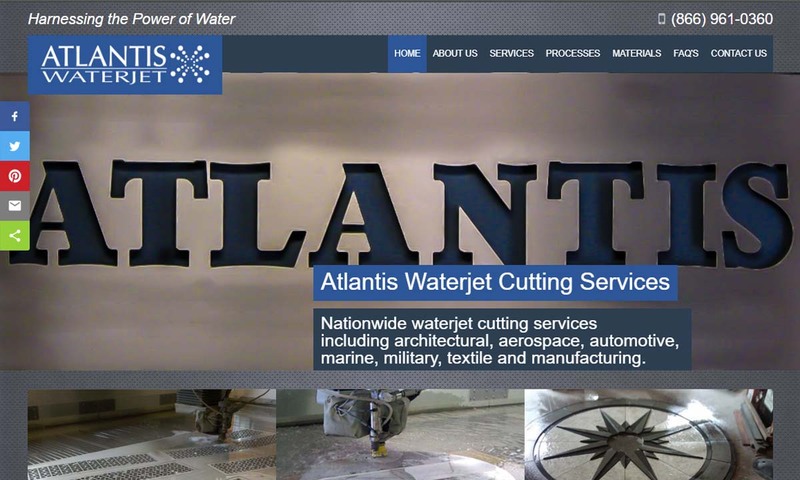 Atlantis Waterjet Cutting Services provides Nationwide Water Jet Cutting Services to cut standard and prototype parts from CAD files or dimensional drawings. We offer many production choices to our customers. We offer cutting services like water jet cutting to ensure that our products are highly accurate and meet your expectations precisely. People use waterjet cutting equipment both to create new shapes in parts and products and to modify existing shapes in them. They also use it as a complement to other cutting processes, such as plasma cutting and metal laser cutting. Customers of waterjet cutting services and waterjet cut products include those in the aerospace, automotive, industrial equipment fabrication, communications, metallurgy and food processing industries, as well as lumberyard workers and artists. Water Jet Cutting – Precision Waterjet Concepts Inc. Using waterjet cutting, manufacturers can make countless varieties of parts and products. Examples of products they make most often using water jet cutting include interlocking hardware (bolts, gears, etc. ), car parts, electronic components, large assembly line products, and design prototypes. In addition, artists can use waterjet cutting to create geometrically precise and/or complex sculptures. People first started using water jets in the 1800s in South Africa and New Zealand. At the time, they used it as a means to wash away loose coal, rocks, and other debris during mining. In this way, miners were able to stay safe from hazards related to falls, slides, and ricochets. During the 1930s, manufacturers around the world started using water jets to industrially cut things. For example, in the Soviet Union, manufacturers used water jets to efficiently cut large rocks. They did this using water cannons that exerted around 7000 bars of pressure. Meanwhile, in the United States, a Wisconsin-based company called the Paper Patents Company began using narrow water jets to cut paper. They did this by integrating a moving waterjet nozzle into machines that metered and reeled continuous paper. Later, in 1956, Carl Johnson developed a waterjet cutting machine capable of cutting shapes into plastic. While the Soviets were able to cut hard materials using waterjet cutting fairly early on, in the United States, engineers struggled to move past soft materials until the late 1950s. In 1958, Bille Schwacha, who worked for North American Aviation, invented the first waterjet cutting system powerful enough to slice hard materials. Schwacha’s system cut alloys like stainless steel using hypersonic liquid delivered in a jet from a 100,000 psi pump. Based on this system, which was not without its flaws, other engineers worked to develop to capabilities of waterjet cutting. For example, in 1962 an employee at Union Carbide, Philip Rice, began developing a pulsing water jet that cut stones and metals using 50,000 psi. Later that decade, other researchers figured out what shape of nozzle delivers the strongest and most precise stone-cutting high-pressure jet. In the 1970s, American engineers successfully designed water jet cutters that used drill technology to deliver 40,000 bars of pressure. After that, they discovered the usefulness of abrasives in material finishing. In 1982, Dr. Mohamed Hashish published the first scholarly writing on abrasive water jets and how much they help manufacturers in the pursuit of efficiently cutting hard materials. In 1987, he received a patent for Abrasive Waterjet (AWJ) cutting. In the 1990s, computer engineers led by Dr. John Olsen at the OMAX Corporation developed new computer software for controlling nozzle movement. OMAX and other companies following their lead began merging new CNC technology, such as the OMAX software, with older waterjet cutters to create advanced systems that operators could move with great control. This allowed manufacturers to waterjet shapes with greater required levels of complexity and tighter tolerances than ever before. Then, in the early 2000s, waterjet engineers introduced zero taper water jets, known as dynamic waterjets. 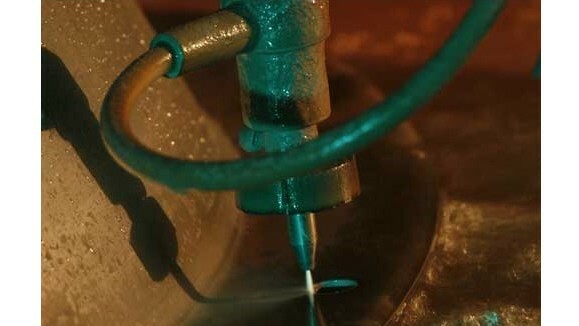 One of the most important equipment components that abrasive water jet engineers have made so far is a nozzle that can withstand some of the highest pressures possible. One of the most durable AWJ nozzles, for example, is made from tungsten carbide composite. Today, engineers in this field are working on developing commercially viable micro abrasive waterjet technology. As time goes on, we expect the water jet cutting industry in general to gain new capabilities and become even more efficient and environmentally friendly. Waterjet cutters work on a wide range of materials, including plastics like acrylics, rubber, steel, aluminum, copper, granite, plexiglass, cork, wood, and some ceramic and glass materials. Waterjet cutting is a phenomenal cutting process, but it is not meant for all materials. On one end of the spectrum, for example, some ceramics and glass thicknesses and compositions are simply too weak to withstand any waterjet and would likely shatter if exposed. On the other end of the spectrum are materials like diamonds, which are too hard to be cut with waterjets. In addition to these are hydrophobic elements and moisture-sensitive materials, which cannot function if exposed to water. Before the waterjet cutting process begins in earnest, operators program the equipment to cut at the pressure levels they want. (Waterjet cutters typically generate between 30,000 and 90,000 PSI, though systems designed to cut and machine very strong and/or thick materials, can reach pressure levels up to 120,000 PSI.) Once they’ve set the pressure, operators authorize the machine to begin working. First, water runs through the high-pressure pump. Then, via high pressure tubing, the water moves to the nozzle. If this is an abrasive spray, it’s here that the water will mix with the abrasive. Either way, inside the nozzle, an aperture sharply focuses the water into a thin stream. Next, the machine ejects the stream of water from the nozzle. As the water makes contact with the workpiece material, it cuts through it with extreme precision and force. Waterjet cutting service providers can configure equipment and otherwise design aspects of the process to make it produce the best results for your application. Aspects of the process and process machinery that they consider and customize include jet stream pressure, type of adhesive/presence of adhesive, aperture size, aperture spacing, aperture material, and CNC involvement. Waterjet cutter operators choose the strength of a jet stream based on the characteristics of the material to be cut. If they plan to treat brittle materials like ceramics and glass, in order to avoid unwanted breakage, they must use much lower pressure and no abrasives. The toughest materials, on the other hand, require abrasive water jet cutters, which combine fine abrasives and water in a high-pressure stream. Waterjet cutting machines are equipped to take on product runs of all sizes and they may also be designed with multiple, simultaneously operating heads. Almost always, in order to increase precision and efficiency, they are managed by CNC (computer numerical control) systems. CNC-managed systems, which can carry out software-designed operations, allow for decreased space between cutouts, fewer errors, less material waste, and faster turnaround speeds. Typically, waterjet cutting machines are made up of at least the following components a nozzle, a nozzle muff, high pressure fittings, an attenuator, apertures, a catch tank or secured holding, and CNC programming. The nozzle, which some call a mixing tube or focusing tube, pushes water through the apertures. Usually, manufacturers make it from stainless steel. The nozzle muff is a brush or sponge that prevents splashing. The high-pressure fittings feature holes in the side. They make sure that, if the nozzle were to begin leaking, the liquid contained would disperse safely, rather than blasting out under pressure. The attenuator regulates water output pressure and keeps it sustainable. The apertures are usually made from ruby, diamond, or sapphire. For that reason, they are often called jewels. Their job is to focus the water so that it can emerge from the nozzle in a perfect beam. The catch tank collects stray water and debris, so that operators can reuse it. Waterjet CNC programming is a combination of software and electronics that controls the cutter movements. There are many different types of waterjet cutting. 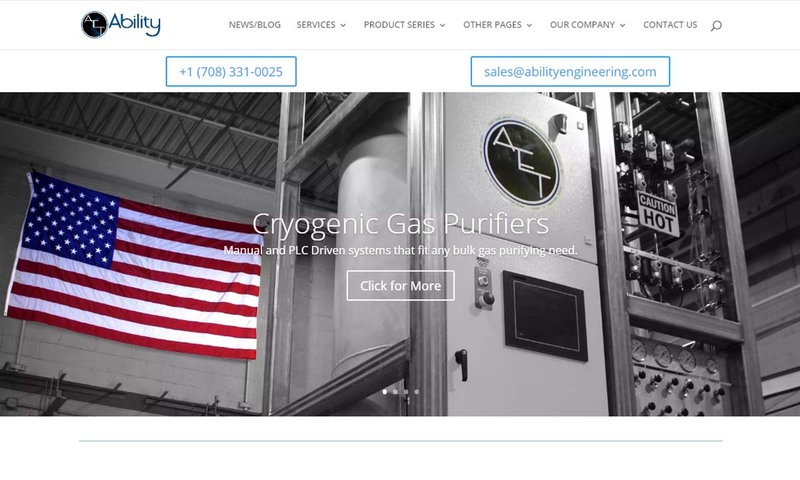 Examples of these different processes include abrasive waterjet cutting, abrasive flow machining (AFM), pure water jet cutting, and CNC water jet cutting. Abrasive water jet cutting, or abrasive jet machining, is a waterjet cutting process that involves the use of water mixed with abrasive materials. Examples of materials operators may use include garnet, diamond, and sand. This process is common with metal cutting/eroding and the cutting and shaping of stone, brick, and marble. Abrasive flow machining (AFM) is a secondary process that manufacturers use to perfect hard to reach and internal sections of products and machinery. This process provides services including burr removal, crack removal, polishing, and smoothing. Pure waterjet cutting does not require the use of any abrasives. It is the original waterjet cutting process. With it, manufacturers can cut into softer materials, such as paper, rubber, and cloth. CNC waterjet cutting is any water jet cutting process that integrates CNC software to perfect cuts. Waterjet cutting services are popular with customers for many reasons. Among these are those related to precision, cold-cutting, material reclamation and environmental friendliness, efficiency, cost effectiveness, rate of worker injury, and adaptability. First, unlike conventional cutting processes, such as blade cutting, waterjet cutting processes do not create burrs or other imperfections. Rather, they create parts with precise and smooth edges. When paired with CNC machining, precision waterjet cutting machines can cut out patterns and holes of all shapes and sizes. Second, unlike laser cutting, waterjet cutting does not use heat, but is rather a cold-cutting process. This fact creates a ripple effect of benefits. One of these is the fact that waterjet cutting does not put products at risk for warping from friction, discoloration, or other related damage. Another advantage of the process’s lack of heat is the fact that it allows for the shaping of heat-sensitive materials without the threat of accidental ignition or melting. What’s more, because waterjet cutting is a cold-cutting process, it is more efficient than other processes; it can be used to cut and stack several sheets of raw material simultaneously. Another benefit of waterjet cutting services is the fact that they have a high capacity for materials reclamation. Service providers can collect, sort, and reuse the majority of the abrasive media and water expelled from waterjet cutting machine nozzles. This not only saves time and money, but also reduces environmental impact and increases sustainability. Next, waterjet cutting is a low energy, high efficiency process; it’s the best of both worlds. Without gobbling much energy, it can quickly create perfect shapes. Waterjet cutting services have low material costs. In addition, because of their fast and easy setup, simple maintenance, and the fact that operations can continue for up to 20 hours straight, waterjet cutters are incredibly cost-effective. Another benefit of waterjet cutting is the fact that it presents such a low risk of workplace accident or injury. Waterjet cutting is a service that operators can quickly change for new applications. It is also highly adaptable in general. Manufacturers can cut patterns into materials for new technologies. 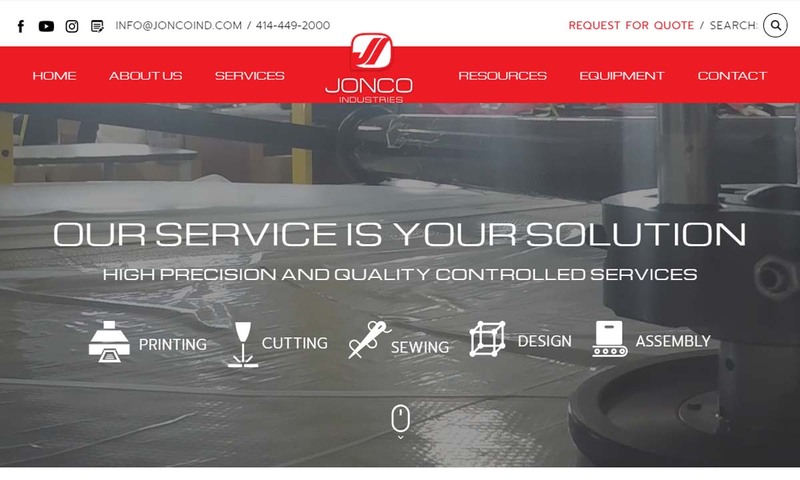 If you are interested in waterjet cutting services, you need to make sure to pair with a service provider you can trust. To help you find the right supplier for you, we’ve put together a list of some of the best ones we know. Narrow them down by considering your application specifications, as well as your standard requirements, timeline, budget, delivery requirements, and post-delivery preferences (installation assistance, parts replacement, warranties, etc.). We recommend that you browse the water jet cutting companies we have listed while using your specifications as a guide. 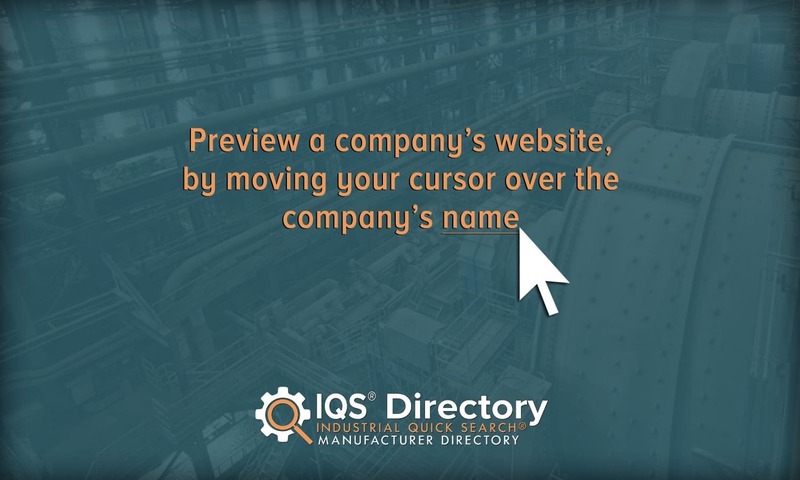 Pick out three or four companies, then contact each of them for a quote. Once you have communicated with representatives from each company, compare and contrast their services and capabilities, and pick out the right one for you. Good luck!